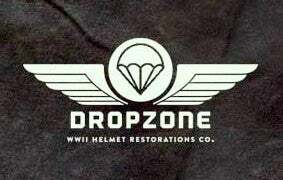 Dropzone Helmet Restorations Co. — WWII M-1 Helmet Liner. Perfect for Early War US Army or USMC. WWII M-1 Helmet Liner. Perfect for Early War US Army or USMC. For sale is a fully restored CAPAC-Westinghouse Liner. New HBT webbing, (Parkerized) Steel A-washers, standard sweatband, Fixed liner strap & Nape strap. Liner is in overall good condition (No cracks or holes), maybe just a slight blemish here & there. If you are doing an Early War US Army or USMC impression, this would ideal for you! (Parts are supplied by DOT/Scovill, Anchor, At The Front & Jmurrayinc1944).